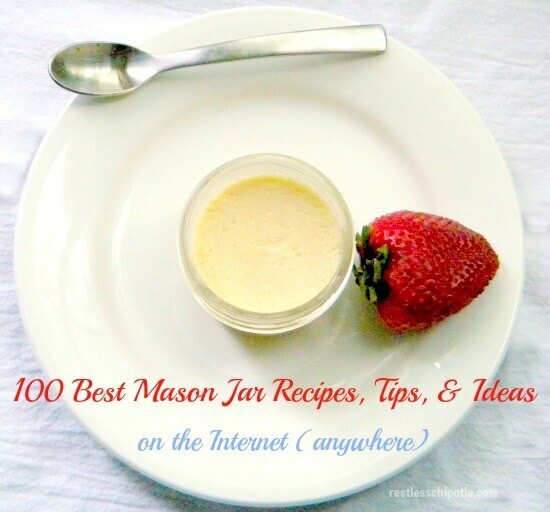 Have you notice just how many Mason jar recipes there are? It seems that every singe blog has them — and for good reason. The foods in jars are easy to transport, super cute, and fun to make. Let’s just call it Mason Jar Mania, shall we? You guys know that I did the first 50 Best … recipes post way back in 2007. There have been others since then, both here and on other blogs but I still think that mine cover the most territory. I try to introduce you to new blogs that you might not see otherwise. This post is double the usual because there are just so many recipes, ideas, and tips that you can’t stop at 50… Well, I couldn’t anyway. There was always one more to add. Mason jars are easy to find almost anywhere and they are very inexpensive. They are eco-friendly, store easily, and don’t transfer flavors. You won’t have to worry about onion flavored creme brulees ever again. Pack foods in layers to make it pretty. After all, you can see through the glass and pretty is half the fun! When making salads in jars always put the dressing at the bottom and the crunchy stuff lik croutons on the top. Shake to mix. Use ribbon, raffia, and other decorations to attach forks or spoons. You can get vintage silverware inexpensively at thrift stores. It looks fabulous on the jars, especially if you will be using them at a party or giving as gifts. Use the half pint jars to make up individual servings of ice cream for parties. This way you can make them well ahead of time and store in the freezer until the party — one less thing you have to do! Mason jar meals are perfect for picnics or tailgating parties. To keep the jars from hitting together in trasnit wrap them with a cloth napkin tied at the top with ribbon or raffia.Tie the silverware into the ribbon for convenience. You can find specially made drink tops with straws that make mason jars into covered drink cups. Put pretty cupcake papers over the lid before adding the screw on top OR put them on after and tie with ribbon. Use chalkboard paint labels to identify the contents or the owner. People won’t be losing their cups at parties. When baking in canning jars only fill them up about halfway unless the instructions tell you otherwise. The food with increase in size as it bakes. This is NOT true with custards. They will stay the same. Yeah, o.k. there are over 100. I couldn’t stop. Everyone is using canning jars for nearly everything now. It makes me laugh because I have been using them forever, myself. They are easy to use, you can use them over and over, no fear of BPA, and they’re cute. What’s not to like? Leave a comment and let me know your favorite Mason Jar Recipes and how you use your canning jars… besides canning.